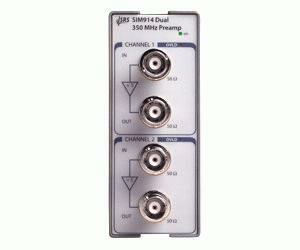 The SIM914 350 MHz Preamplifier contains two wide-bandwidth, DC-coupled amplifiers, each with a gain of 5 (14 dB). Its fast rise time, low noise and excellent DC accuracy make it an ideal instrument for amplifying signals like those from photomultiplier tubes and photodiodes. The gain stages of several SIM914s can be cascaded without creating oscillation problems. Input clamping gives a 3 ns recovery time from a 10´ overload.